﻿ Sewing machines, thread, conveyor belts - Adjustable conveyor belt | Metripond Plus Kft. Transports filled bags for packing onto pallets. 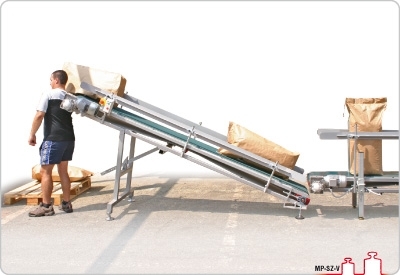 Transports stitched or welded sealed bags horizontally at shoulder height. Adjustable transport height enables personalised settings. - The side of the transport belt is fitted with a bag support which can be height- and width-adjusted. - The high voltage switch cupboard and button (start, stop) unit are mounted on the belt assembly. ** The price of the installation varies depending on the site of the mounting and the task. Offer or contract prices are individually agreed upon having the information from above -on your request.